Phone reception can be intermittent so if no response please send an email; we will get back to you soon. 1) Confirmed the survey with the broker or owner. 2) Signed a contract and paid a deposit if required. 3) Arranged the lift with the boatyard and owners. 4) Access arranged with the owners or brokers. 5) Booked the date and time with me. The vessel needs to be in a reasonable state to allow access to all required areas. 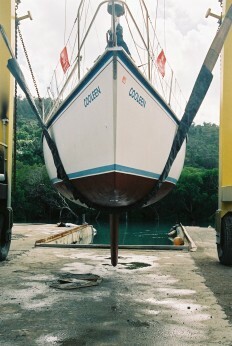 A cluttered boat over flowing with gear and junk will hamper the process. It should be ready for operation, for example an engine with the starter motor missing will seriously affect the test! If the boat is in the water then the onboard inspection and sea trial will take place and then the vessel will be lifted for underwater inspection. This lift needs to be organised prior to the survey and any cost for this (Rebak Marina and Boatyard in Langkawi are very reasonably priced), is a client expense. If in the water ideally the bottom and prop should not be too fouled as this will affect performance. If the bottom is dirty then sea trial will take place after the lift so the hull is scraped prior to the trial. Out of water inspections are important, propellors can be corroded or damaged, rudders, keels and hulls compromised, delaminating or blistered (GRP osmosis) and more. Metal hulls may be excessively thin in places and the only way to discover these facts are by lifting. Moisture meter, start current and ultrasound thickness testing equipment is used depending on the vessel material. If the vessel is already out of the water the process is reversed and this has the benefit of a clean hull for the sea trials. Sea trial supplies real life information on critical systems, engine, prop, sails, battery charging, sail hardware and all the gear you will be using regularly; far better to discover an issue before you set off on your first voyage. For some research have a look at the link for the ebook shown below. 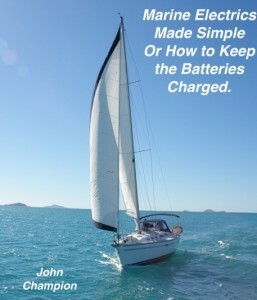 Marine Electrics Made Simple.